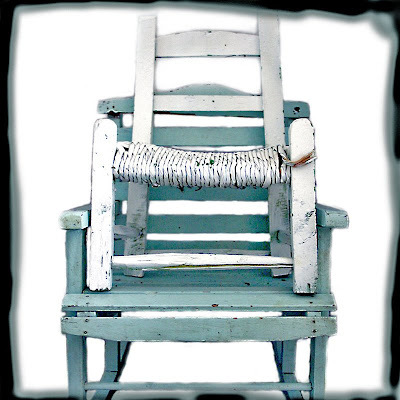 Yesterday blue chairs were all over the blogosphere. I found this at Iconolatrie & this at Something White. I am such a sucker for blue chairs. in a greeny/blue color I really liked. or perhaps go back to white. Remembering how some people told me this was soothing. But the white feels more free, so I don't know. Decisions are not easy for me today. It will all be fixable if I change my mind. Well not to confuse matters, but I love the colors of your blog now. Just started following your blog lately and started my blog recently and well I had anxiety about the whole color thing for 2 weeks. Why do we do this to ourselves? this is a big decision.... i admit to spending many an hour dithering with my blog design. your blog is completely unique and so very much you... go with what feels happy, right and good. we will love it if you do! Celeste - The tinkering keeps me from making real art, which I feel quite incapable of right now, but it keeps my hand in a creative mode. And figuring stuff out takes time, and that's helping keep me calm during all the Mary sadness. And Robin - Bless you! Sometimes being "me" just doesn't seem good enough - I want to be YOU, or Maddie or Jaime or Tangobaby or someone else. But I'm back to me. I think all I'm gonna do is change the type justification to center justify & go with that - it helps to separate the center from the sides & I like that. PLUS it makes my blogs look longer & evermore deeper!! Debi...we will all LOVE your blog no matter what you do to it. It is such a comforting place to be. I love it here, no matter what colour..but you have indeed chosen colours that are soothing and easy on the eyes and spirit. And your photos and paintings leave me floating in other worlds. Thank you for being here, dear friend. Jaime - Bless you. And thank YOU for being THERE!